The ear has a sensitivity and range that easily outperforms the most elaborate sound system ever manufactured. 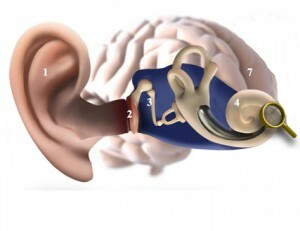 The ear contains many physiological mechanisms, and a breakdown or disruption in any of these can cause hearing difficulties. In general, there are two main types of hearing loss, conductive and sensorineural. When an individual has both conductive and sensorineural hearing loss, they are said to have a “mixed” hearing loss. This type of hearing loss is a condition of the outer and/or middle ear. It occurs when sounds from the outside world cannot be transmitted normally through the ear canal and/or middle ear to the nerve cells of the inner ear. Conductive hearing loss can be temporary or long term. The most common causes of this type of hearing loss can be a build-up of wax in the ear canal, fluid in the middle ear space (common in children), perforated eardrums, or damaged or defective ossicles (middle ear bones). 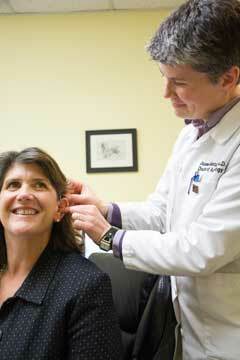 Most conductive hearing losses can be medically or surgically treated. If the conductive hearing loss for some reason cannot be alleviated, hearing aids can do a lot to compensate for the loss. This type of hearing loss is the most common form of hearing impairment. It happens when some of the delicate hair cells inside the cochlea (inner ear) get damaged and are unable to transform the sound vibrations into electrical signals. Sensorineural hearing loss can be caused by long-term exposure to loud noise, exposure to certain medications, disease, infection, heredity, or most commonly, by the aging process. Once sensorineural hearing loss sets in, the condition may continue to worsen and will, in most cases, be permanent. Typical symptoms are a loss of loudness, and difficulty in understanding speech clearly. Fortunately, advanced hearing aid technology is available that can effectively treat sensorineural hearing loss.